Set up email forwarding to send your incoming Office 365 email messages to any other email account (such as Gmail, Yahoo, or Hotmail.com). In the top right corner, click (Settings). Scroll the Settings pane down to Your app settings and click Mail. On the left pane, find Accounts. If it is collapsed, click to expand. Select Forwarding. 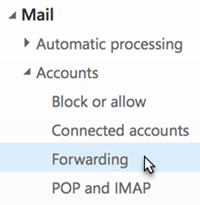 Required: If you don't see the Forwarding option under Accounts, your account may not support email forwarding. Contact your email administrator. Under Forward my email to, enter the email address that you want your incoming Office 365 email to be sent to. Check the Keep a copy of forwarded messages box to keep copies of your incoming email in your Office 365 inbox. 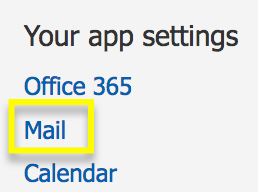 Warning: If you don't check this box, after the email is forwarded, it will be deleted from your Office 365 account. Click Save, at the top of the screen.